The winter break has featured some disconcerting news for Bundesliga fans, as WfL Wolfsburg superstar Edin Dzeko finalized his transfer move to Manchester City and Werder Bremen leading scorer Hugo Almeida left for Turkish club Besiktas. Stars Jefferson Farfan of FC Schalke 04 and Demba Ba of 1899 Hoffenheim are pouting, upset with their clubs refusal to let them transfer. But there has been good news, too, perhaps the biggest of which is the return to action of Bayer Leverkusen’s midfielder Michael Ballack. The German international returned to the Bundesliga last summer from Chelsea, but was injured and has been able to contribute little to Bayer Leverkusen’s successful Hinrunde. But Ballack got back ono the pitch Thursday in Leverkusen’s friendly with Rot-Weiss Oberhausen. In a match played in pouring rain, Ballack came in at the beginning of the second half in place of Lars Bender. Leverkusen won the friendly. 2-1, on goals by Bender and Eren Derdiyok, with reserve keeper Fabian Giefer playing well, too, but more important was the fact that Ballack was able to get 45 minutes of action. Ballack had a shot on goal in the 63rd minute but was denied by Oberhausen goalkeeper Soren Pirson. After the match, Ballack stated that “That was a good start for me. Of course I need a bit more practice after such a long break. But I am happy for now. We have an excellent team and can achieve a lot in the second half of the season.” It’s encouraging that Jupp Heyneckes felt confident enough about Ballack’s injury recovery that he permitted Ballack to play under less than ideal field conditions in Oberhausen, as the combination of snowmelt and rain made for a soggy pitch. With Stefan Kiessling having returned from injury just before winter break, Ballack’s return to health is a another positive for Leverkusen’s pursuit of first-place Borussia Dortmund. Die Werkself can make a dent in Borussia Dortmund’s ten point lead when they face Dortmund this coming Friday in the kickoff of the second half of the 2010-2011 Bundesliga campaign. 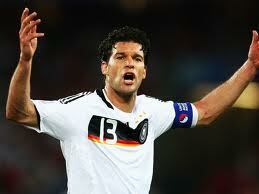 Ballack, 34, was born in East Germany before reunification. He began his career at Chemnitzer FC before joining 1.FC Kaiserslautern in 1997. After two years there, he made breakthrough after transferring to Bayer Leverkusen. Ballack’s first stint at Leverkusen ended in 2002. Ballack won the German double three times with the Bavarians, in 2003, 2005 and 2006 before he left for EPL club Chelsea. Ballack scored 85 goals in Bundesliga competition, and another 11 in Pokal Cup competition. In his four seasons at Chelsea, Ballack was part of one EPL title-winner and three FA Cup titlists. He netted 17 times in 105 EPL games and scored five times in FA Cup games. Ballack returned to Bayer Leverkusen in 2010 but suffered a shin injury September 11 against Hannover. Ballack also has made 98 appearances for the German national team, scoring 42 times. He’s missed many opportunities with the national side due to injury, but still Germany’s captain was named to the FIFA World Cup Team of the Tournament in 2002 and 2006. Injury sidelined him at last summer’s World Cup in South Africa. Ballack has also played in over 90 European club matches, scoring 19 goals.